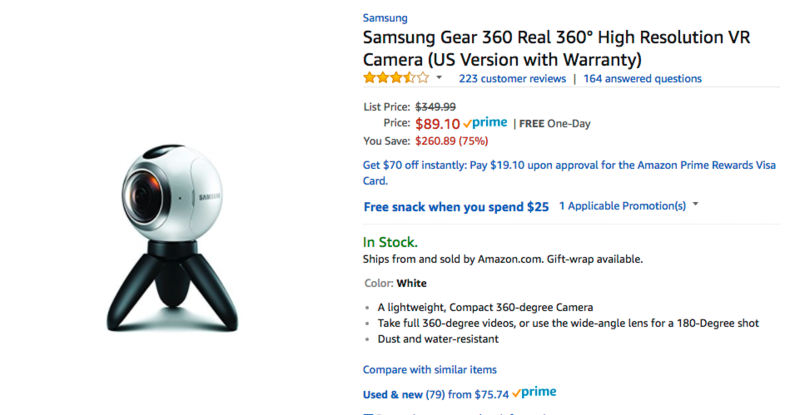 The first-generation Gear 360 camera may not be the newest kid on the block anymore (the new model will be called the 360 Round, and it'll be announced at IFA), but it still gets that 360-degree image/video job done. 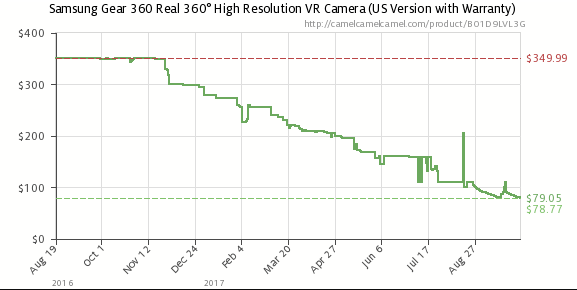 Plus, it's now available for just $89.10, the new lowest price we've seen, on Amazon. That's a full $10.89 lower than the last time we posted about a Gear 360 deal. Getting the job done are two 180-degree wide-angle lenses, which work together to produce 360-degree content. It's capable of 30MP pictures and 3840x1920 video. And since it's IP53 certified against water and dust immersion, it's also pretty rugged. Samsung says that it's only compatible with recent flagships from the Korean company, but there are modified APKs out there that will allow you to use it with other devices. If you're interested, feel free to purchase one from the source link below. Interestingly, it appears that Amazon has begun to run a "free snack when you spend $25" promotion that gets you a bag of trail mix free of charge. Get your cheap 360 (and free snack) soon if you want one, as we're not sure how long this deal will last. Here's a new all-time low: $77.78. 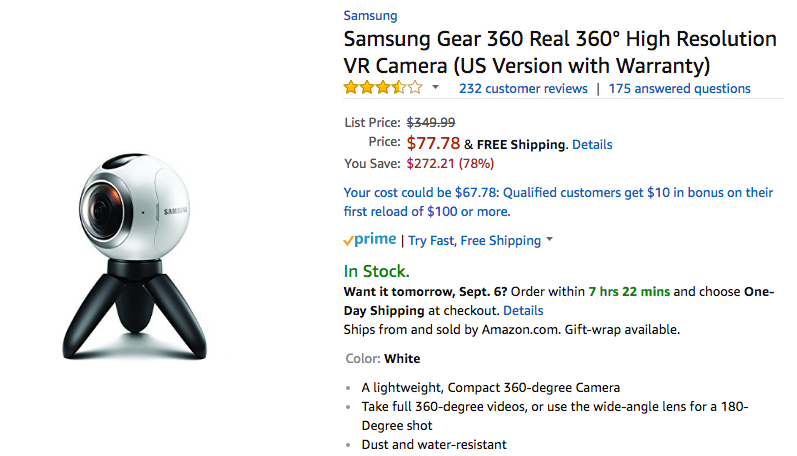 The Gear 360 has been free-falling in price on Amazon and the latest we've spotted is $77.78. That's easily one of the cheapest and best ways to check what all the 360 photography fuss is about. You can use the same link as below to grab it.